Together with Iceland’s Skaginn 3X and partners, processing technology firm Njord has signed two major contracts for delivery of fish processing plants in the Russian Far East—and is now eyeing a third large order in the same region. 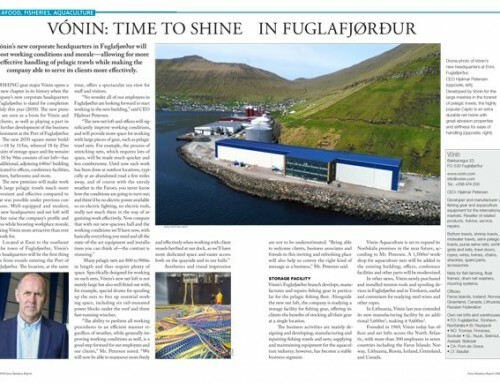 The Far East contract wins follow in the wake of Njord’s successful delivery, together with Skaginn 3X and partners, of two advanced fish processing plants in the Faroe Islands: Varðin Pelagic at Tvøroyri, opened in 2012, and Pelagos at Fuglafjørður, opened in 2014. The former, now rebuilt, redesigned and reinstalled, is set to reopen by August this year after a serious fire incident, which occurred in the early summer of 2017. 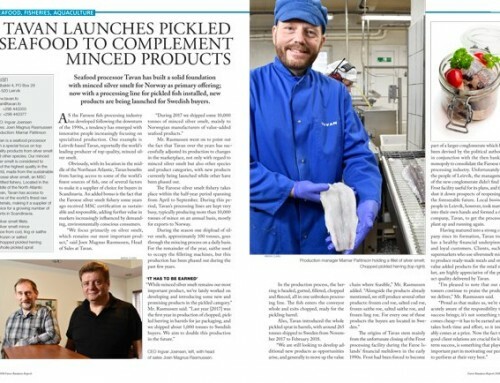 Apart from setting up large factories, Njord are frequently hired to help put together business development projects of various sizes, especially in the seafood industry. 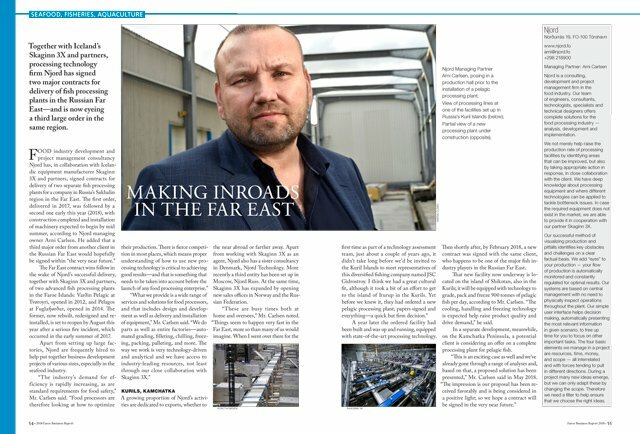 A growing proportion of Njord’s activities are dedicated to exports, whether to the near abroad or farther away. Apart from working with Skaginn 3X as an agent, Njord also has a sister consultancy in Denmark, Njord Technology. More recently a third entity has been set up in Moscow, Njord Russ. At the same time, Skaginn 3X has expanded by opening new sales offices in Norway and the Russian Federation. A year later the ordered facility had been built and was up and running, equipped with state-of-the-art processing technology. 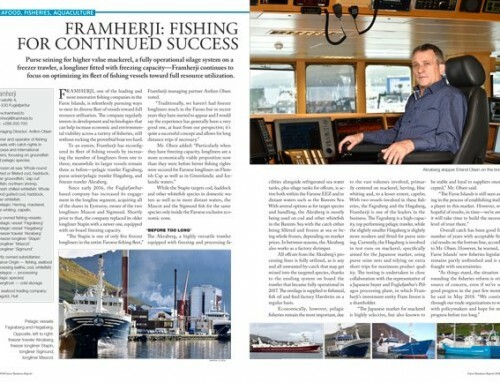 Then shortly after, by February 2018, a new contract was signed with the same client, who happens to be one of the major fish industry players in the Russian Far East. 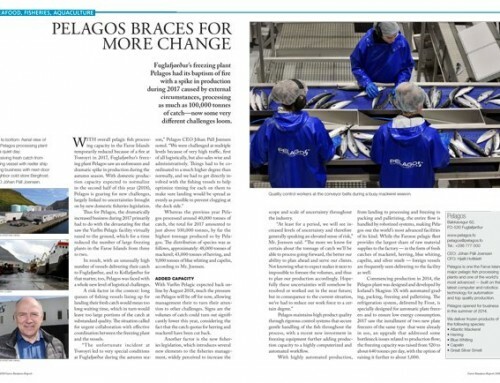 That new facility now underway is located on the island of Shikotan, also in the Kurils; it will be equipped with technology to grade, pack and freeze 900 tonnes of pelagic fish per day, according to Mr. Carlsen. 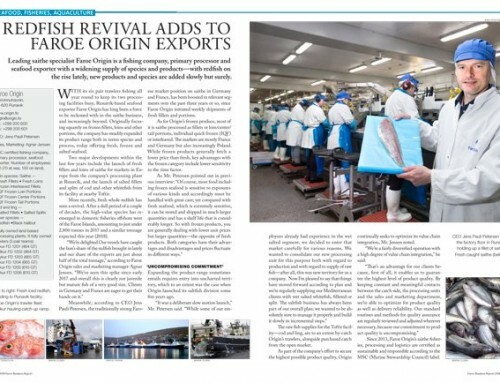 “The cooling, handling and freezing technology is expected help raise product quality and drive demand,” he said. In a separate development, meanwhile, on the Kamchatka Peninsula, a potential client is considering an offer on a complete processing plant for pelagic fish.